Note: Several spellings exist for Coega. These include Ngqura, the Xhosa spelling which is used in the port of Ngqura Establishment Act and is the official spelling used by the National Ports Authority; Ngqurha, as has been used on occasion by the Department of Public Enterprises; and Coega which is that used by the Coega Development Corporation, the Industrial Development Zone and most other people. Other spellings include Cougha, Coecha, Koecha and Koega. 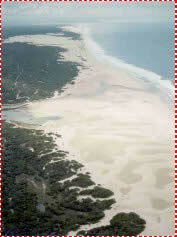 The name is of Khoekhoen origin for the river of the same name and means 'ground water.' Coega is pronounced 'koo-gha', with a guttural sound forming the last syllable. To pronounce Ngqura correctly requires an ability to sound the click as used in Koekhoe and Xhosa. The port of Ngqura, which began commercial ship operations (containers) in October 2009, lies some 20km northeast of Port Elizabeth and is South Africa's 8th and latest commercial port development, situated at the mouth of the Coega River in Nelson Mandela Bay (Algoa Bay). Transnet National Ports Authority of SA is responsible for developing the deepwater port, while Transnet Port Terminals (TPT) has been appointed to handle all terminal operations. An Industrial Development Zone, known as the Coega IDZ, has been developed over the 12,000 hectare site in the area including the river and port, with a 4,500 ha core development immediately identified. The IDZ will serve as a primary location for new industrial development for export driven industries. The port is of deepwater construction capable of serving post-Panamax dry and liquid bulkers and the new generation of cellular container ships. The horizontal geometry of the port is such that 150,00DWT bulkers and 6,500TEU cellular container ships can manoeuvre within the port, although initial dredging is being limited to accommodate the design vessels only. The new port consists of a main eastern breakwater, 2.7 km in length extending into Algoa Bay to a maximum water depth of 18 metres, and a secondary western breakwater 1.125 km in length. The two breakwaters are positioned and laid out in accordance with the requirement of an exclusion zone of some 500m around the St Croix group of islands offshore from the port. Five berths (initially) totalling 1,800m of quay wall - two for containers, two for dry bulk and breakbulk cargo and one for liquid bulk cargo have been provided. The berths have 150 tonne bollards and fenders at 20m centres along the berths with a proprietary fender system at the container terminal and double tyre fenders at the bulk berths. A total of 32 berths have been identified in the fully developed port with the intention of developing the port further up the Coega River valley and southwest along the coast. The main breakwater is the longest in South Africa. Both breakwaters are of rubble mound construction, with 2,300,000 m³ of armour rock each of 3 to 6 tonnes quarried from the Coega Kop area 9 km inland from the port. A layer of 30-tonne concrete dolosse provides breakwater protection, with 25,000 of these units cast on site and placed in position. Capping of the breakwater took 102,000 m³ of mass concrete, with five caissons anchoring the ends of the breakwaters which required 18,000 m³ of reinforced concrete. The caissons were pre-cast in the dry inner basin ahead of final flooding and floated into position. 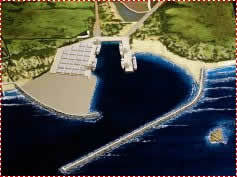 The caissons are designed in order to be moved when further expansion of the port is required. The quay walls are approximately 6m above mean sea level. The inner harbour works required 13.8 million cubic metres of material to be excavated. To achieve this an area of 300,000 m² needed to be dewatered down to 20m below sea level. Dewatering included the provision of a rock fill wave protection wall on the shoreline and a 1.2 km long bentonite slurry cut-off wall installed down to 20m below sea level. The five harbour berths were provided by the construction of 1.96 km of mass gravity, voided, concrete quay walls. This work required the provision of some 270,000 m³ of formwork and 6,000 tonnes of reinforcing. A sand bypass system consisting of jet pumps to divert sand affected by the littoral drift will transfer sand/water slurry from the updrift to the downdrift side of the port (west to east). Funding of the entire port infrastructure (almost R10-billion) has been provided by Transnet, of which the National Ports Authority (landlord) is a subsidiary division. Funding of the adjacent Industrial Development Zone is being provided by central and provincial government, with detail funding to come from private investors. Some R1.8 billion was to be spent by Eskom to increase the provision of electricity to the region for the development of an aluminium smelter, although by 2009 it had become obvious that this was now extremely unlikely given the pressure on Eskom to provide adequate and inexpensive energy on a national basis. Construction of a rail link between the Coega project and the existing Port Elizabeth - Gauteng main railway line has been completed. The existing mainline railway, as well as the N-2 road highway, pass through the Coega Industrial Development Zone. In 2009 the first of two 70 tonne bollard pull Voith tugs, SHASA was delivered from the shipyard in Durban, with a second tug ORCA due for delivery in the first quarter of 2010. The impact of a new IDZ and port at Coega/Ngqura on the Eastern Cape of South Africa will undoubtedly prove of great benefit to an otherwise largely impoverished and undeveloped region. However its effect on the nearby port of Port Elizabeth only 20 km away remains unclear and Port Elizabeth harbour would have to re-develop for certain cargo types only, such as the auto, fresh produce, fishing and tourism industries. In its initial stages the concept of a new port at Coega was floated, at least publicly, as a deep-water bulk port to handle manganese and other bulk ore exports that could be re-directed away from Port Elizabeth and the city. 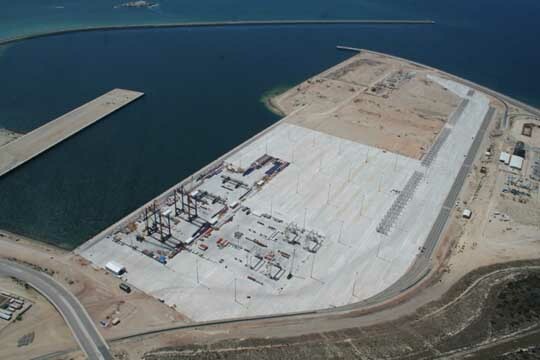 However that changed following an initiative to develop a container terminal at Coega. Much of the emphasis on the new port has therefore switched to clean cargo with a strong focus now on containerised cargo, although manganese ore exports are still likely to be transferred from Port Elizabeth at some point in the future. The political imperatives of building the new port will continue to outweigh all other considerations and the prognosis for Port Elizabeth to remain as a viable and busy port appear reduced. Hopes of developing an aluminium smelter at Coega appear to have been finally dashed following the discovery that Eskom was having difficulty in meeting the country's energy requirements. With the change of emphasis for Ngqura towards container handling it would appear that the future of this port lies in becoming a transhipment hub for the sub-Saharan Africa and Western Indian Ocean regions.